Can I send appointment confirmation e-mails or other communications to my customers? Yes! 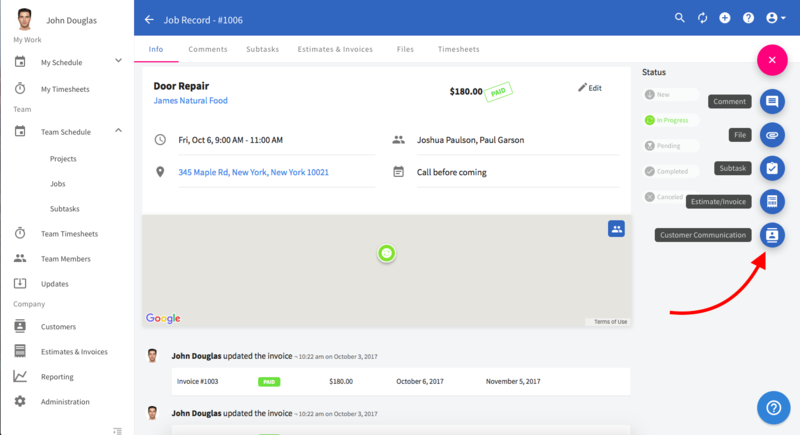 FieldPulse makes communicating with customers easy and efficient. 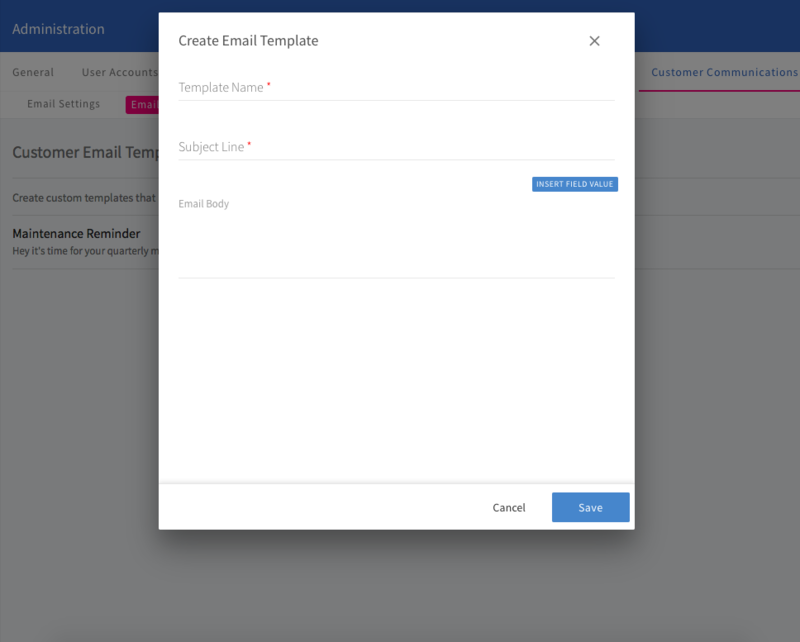 Save time with our email and SMS templates. In this guide we'll show you how to set up and send both. 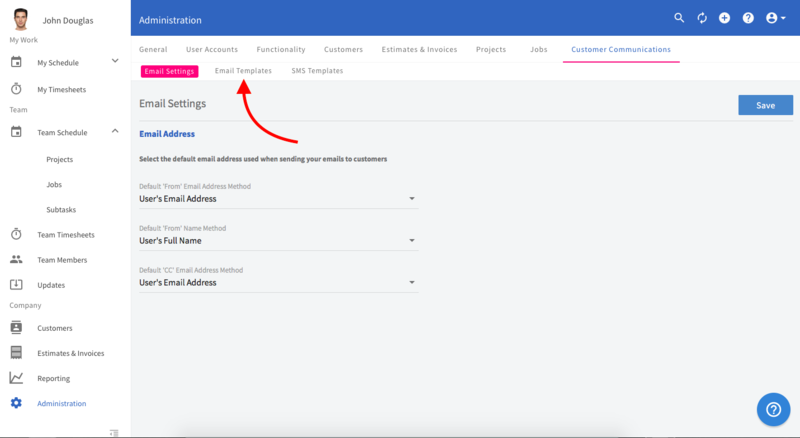 To set up email templates, navigate to Customer Communications by clicking here or clicking Administration in the menu on the left and then click Customer Communications in the top bar. 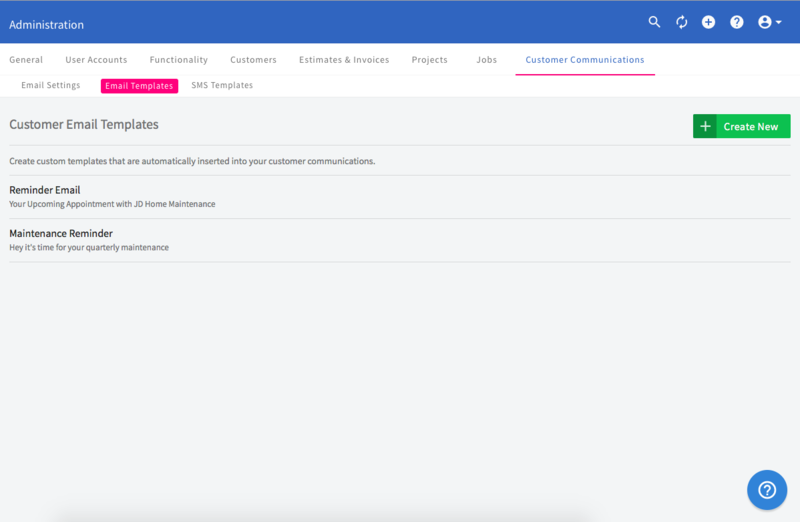 On the main Customer Communications page you can adjust your email settings, like the default 'From' name and address and default addresses to CC on your customer communications. For example you may CC the front office on all of your customer communications. To create a new email template, click on the Email Templates sub-heading. This will pop up the Create Email Template window where you can start building your email template. After naming your template and creating a subject line, you can use Field Values to populate the email with information particular to that customer and job from the details you've already entered into our system. As you can see, you can enter information like Job Location, Job Start Date, Customer First Name and so on. 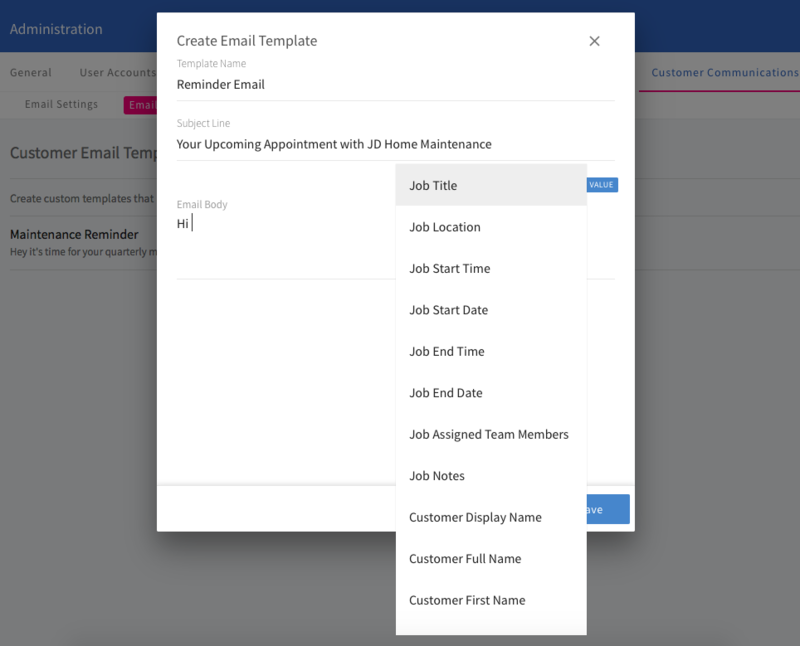 Here's an example email populated with Field Values to personalize it to your customer. 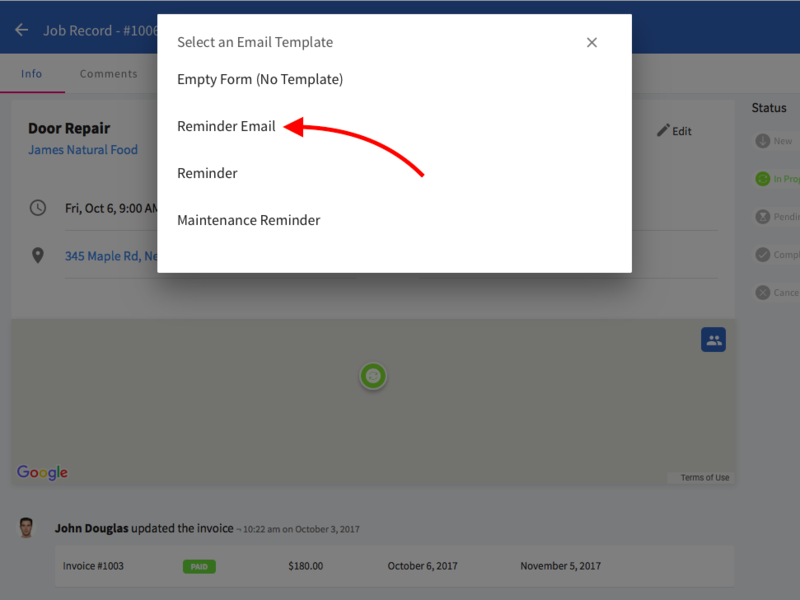 Click Save when the email template is complete. When your email template is saved you'll see it in the list. 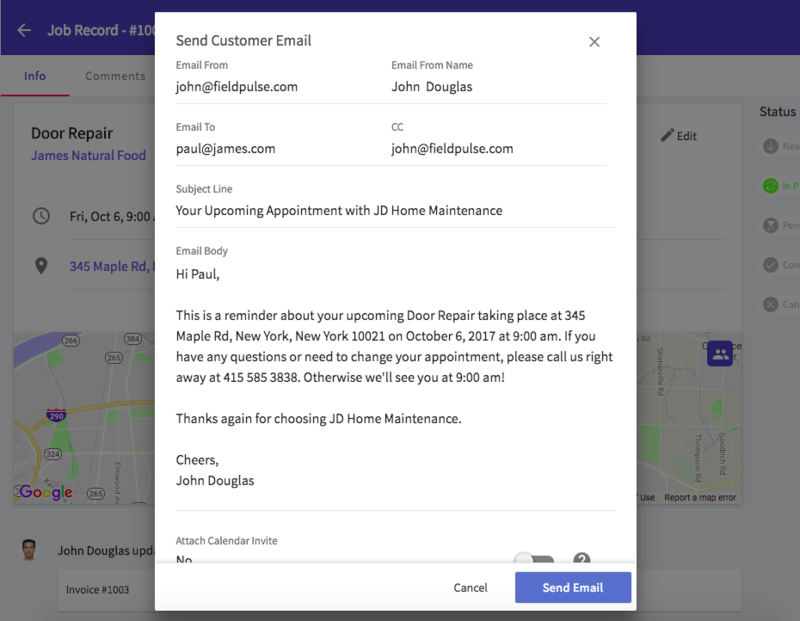 To send the email template to a customer, navigate to the job record that you want to communicate about, and hover over the green action button at top right. 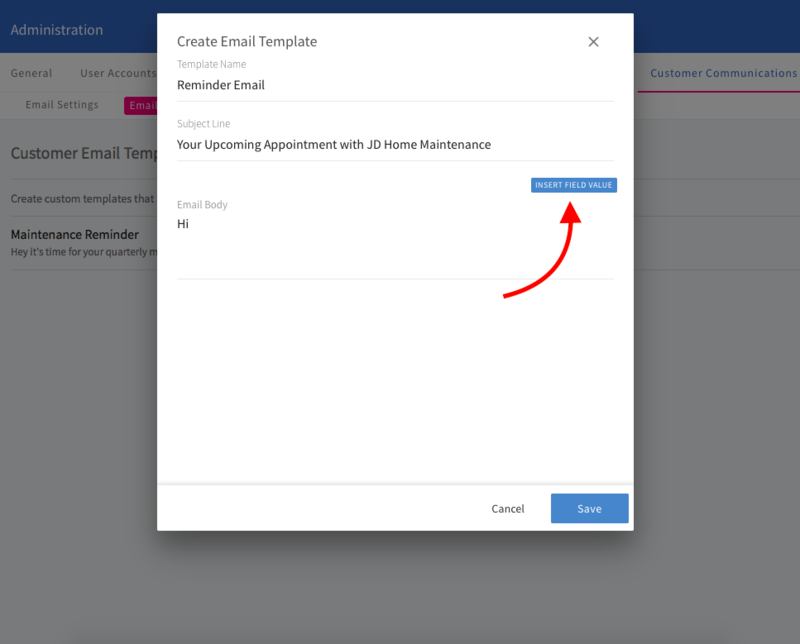 Then select the email template to send this customer. You'll see that all of the field values have been populated and your email is ready to go. Once you've checked the details, click Send Email. You can also set up SMS message templates for your customers. You can use these for more urgent messages, such as an 'On the way' notification. To set up SMS message templates, navigate back to Administration and to Customer Communications. Go directly there by clicking here. 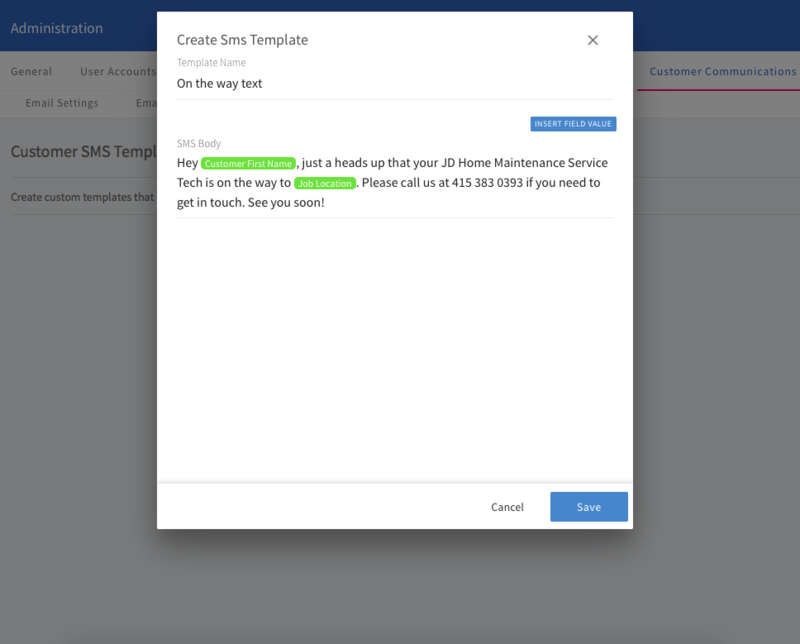 On the SMS Templates page, click Create New. 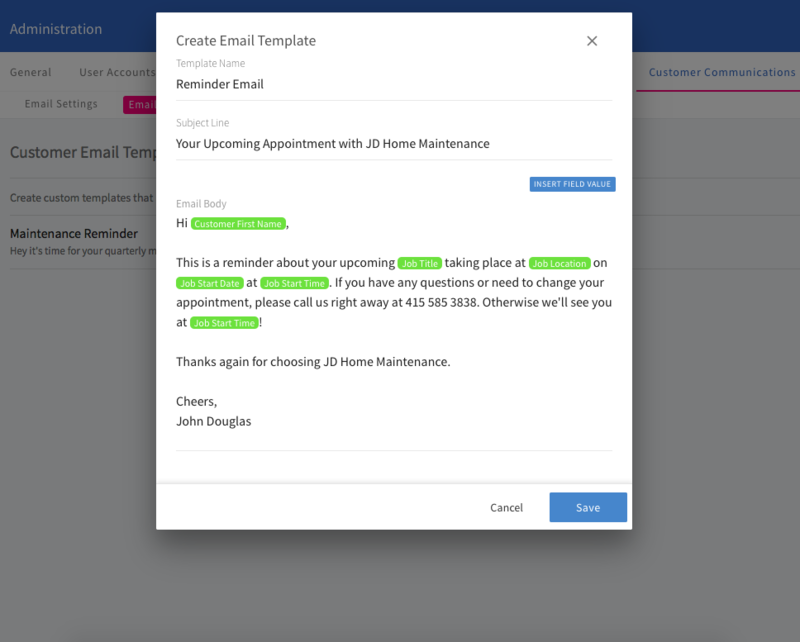 You'll create your SMS Template the same way you created Email Templates, by naming it and creating the message using Field Values to personalize the message. When you're finished click Save. You'll see the new SMS template saved in the list. SMS messages can only be sent from the mobile app. 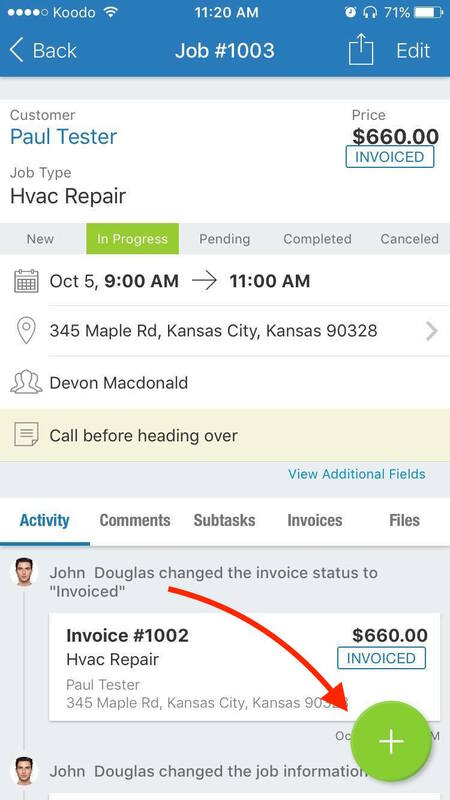 To send a new SMS message from your SMS Template, on the app navigate to the job record and hover over the green + button. 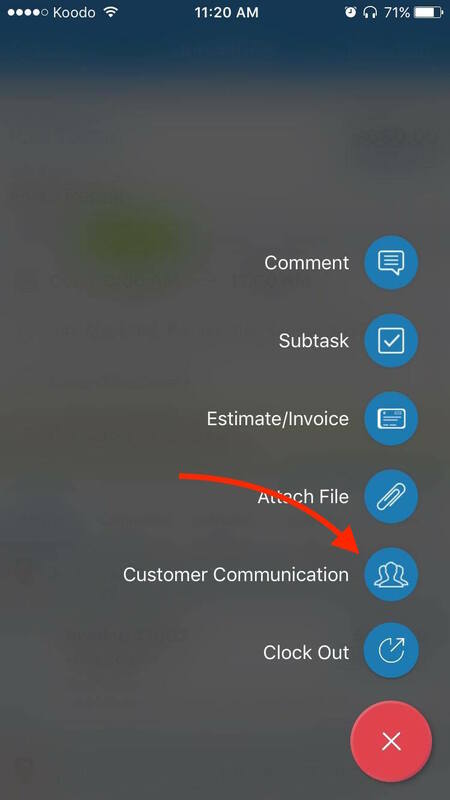 On the next menu, click Customer Communication. 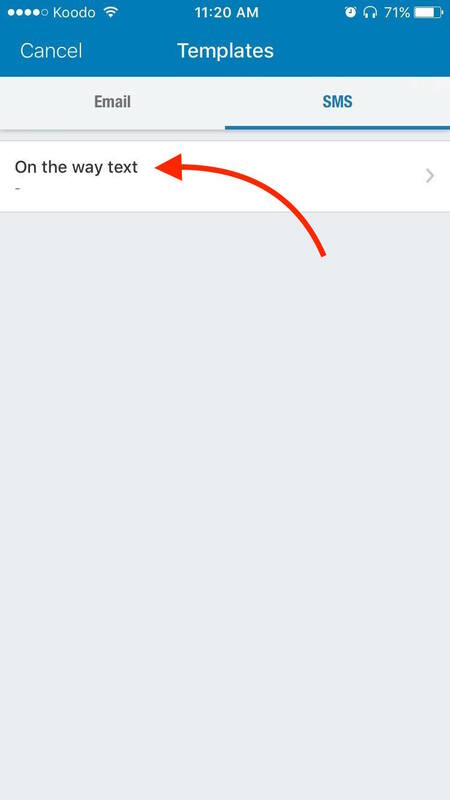 Under the SMS tab, click the template you want to use. 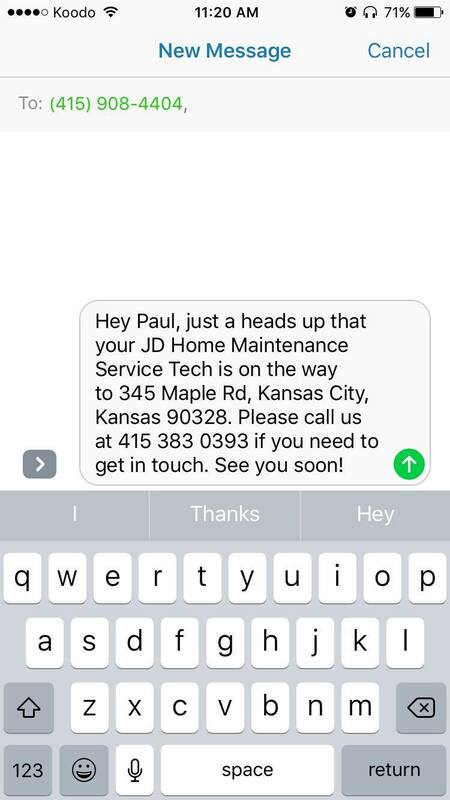 This will populate a new text message to your customer, with the field values filled in with the customers information. Just click send when you're ready.